It was another one of those nights ... I woke up between 3 and 4 in the morning, and couldn't go back to sleep. There wasn't anything big pressing on my soul or spirit, but it was clear that I wasn't going back to sleep soon. I know that this is the time the Enemy likes to sow his lies into my sleepy brain, so I was on guard to take every thought captive. Since this is a regular occurrence for me, and I know that Jesus talks about being prepared in "the night watches" (Luke 12:35-40), I instinctively know that this is a time that God may be calling me to seek Him. So, instead of trying harder to go back to sleep, I chose to spend time with Jesus and see what we had to say to each other. Realizing that I was restless and just a little anxious, a spontaneous thought quickly came to my mind in the form of a question ... Did Jesus model for us what "being at peace" looked like? In my natural mind I tried to run that rabbit and see if I could think of any Scripture in the Gospels that spoke of Jesus being at peace or enjoying peaceful respite. I know the Bible talks about the "peace that surpasses all understanding", but did Jesus, Himself, show us what that looks like for us in our Christian walk? When I couldn't really think of any example in the Bible, I decided to spend these waking moments visiting with Jesus in the garden of my heart. I got still and quieted my mind. In my spirit, I entered through my garden gate and headed down the path to the bench under the big oak tree where we always meet to sit and talk. But He wasn't there! I had a moment of slight panic, but remembered another time when my soul and spirit were dry and I felt emptied of any divine energy. At that time, Jesus had instructed me to immerse myself in the river of Living Water, and while floating there, I felt myself getting filled up; the Living Water from the throne of God seeped through my pores and I was restored and ready to serve Him again. So, when I didn't find Jesus at our meeting place this time, I immediately thought, "I'll just go to the river of Living Water and see if I can be filled with His peace there". I knelt down by the river and scooped the water up, drinking in its sweet flavor, both physically and spiritually. I couldn't get enough! All of a sudden, I was aware of Jesus sitting on the bank, watching me and smiling. He said, "You've instinctively thirsted for the Living Water, which is the source of your spiritual life. But there's more I want you to understand. You are seeking My peace, but I'm not sure you get the big picture. Let me show you more...". At that moment, I drifted off to sleep, but in the morning when I woke up, every inch of my flesh and spirit was eager to go to the Word to see if I could find what He wanted to show me. I instinctively knew that there was a connection between the peace I was seeking and the Living Waters I had consumed in my garden. So, I started in Galatians, Chapter 5, where I knew peace was mentioned in conjunction with the fruits of the Spirit. It read, But the fruit produced by the Holy Spirit within you is divine love in all its varied expressions: joy that overflows, peace that subdues, patience that endures, kindness in action, a life full of virtue, faith that prevails, gentleness of heart, and strength of spirit. All of a sudden, the picture was coming into view ... Peace in my life is a fruit of the presence of the Holy Spirit. I knew that, but I was beginning to understand that peace was not something I could get or produce on my own, APART from the Holy Spirit. On the contrary -- the fruit was the evidence of the power producing it. In other words, it was the power of the Holy Spirit in me, bringing me into union with Christ that produces the peace. My peace is always found when I am filled to overflowing with the Living Waters! Now, I was eager to see if I could confirm that understanding through Scripture. First of all, I found conviction [in the Psalms] that I was awakened in the middle of the night so that I might meet with Jesus. Psalm 119:147-148 says, Before the day dawns, I’ll be crying out for help and wrapping Your words into my life. I lie awake every night pondering Your promises to me. Psalm 4:4 says, Tremble in awe before the Lord, and do not sin against Him. Be still upon your bed and search your heart before Him. Pause in His presence. And Psalm 16:7 says, The way You counsel and correct me makes me praise You more, for Your whispers in the night give me wisdom, showing me what to do next. Now, could I find the connection between thirsting for the Living Water, it's overflowing from my heart, and the peace that I desired? Romans 15:13 spoke directly to me! Now may God, the inspiration and fountain of hope, fill you to overflowing with uncontainable joy and perfect peace as you trust in Him. And may the power of the Holy Spirit continually surround your life with His super-abundance until you radiate with hope! There it was! 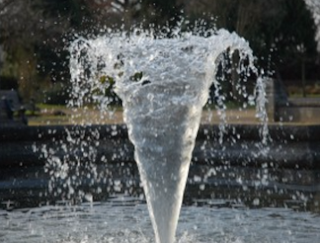 The picture of the Living Water coming directly from God as my source of joy and peace! And that peace comes directly to me by the power of the Holy Spirit to reproduce the character of Christ in me! You know, sometimes, it is easy to say we understand the Biblical concepts that we've learned in Church. But to really understand is a heart knowledge, not a head or analytical knowledge. I knew peace came from God. And I knew that the Living Water was the Holy Spirit overflowing from my heart. But when I tried to see Jesus displaying that peace as a man, I was chasing after the peace of God in my flesh. Jesus always talked about the Living Water as a spiritual concept, not something that we could accomplish in the flesh. So, it was important that I understand that I can only know true peace when I am functioning out of the overflow of the Holy Spirit in my life. So, now I understood what had taken place in the garden of my heart. In my search for Jesus' peace, I was led to drink of the Living Waters, flowing from the throne of God. Jesus wasn't at our meeting place under the shade of the big oak tree because I wasn't going to get instructions for peace from how He modeled life as a human man. 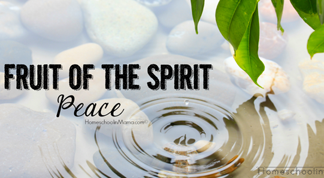 I could only get the peace He knew by being filled with the overflowing joy and peace coming by way of the Holy Spirit, and straight from the fountain of hope, Himself, which is God, the Father. That's why Jesus was waiting for me on the banks that provided the peace I was looking for! In summary, I now understand that true peace is not something I can achieve through earthly measures. I can't do enough, have enough, or know enough [in the flesh] to set my soul or spirit at perfect peace. It is only through the presence and overflowing of the Holy Spirit, that I can know the peace that exists in the Kingdom of God. If I may be so bold, I don't believe you can find real peace in the realm of this earth. The key for us, who are living here until called Home, is the discernment that God's peace only exists in God's Kingdom realm. The only way we can experience His Kingdom while still on this planet is in the realm of the Holy Spirit. It all comes down to this ... Divine Peace exists in the realm where God is. God's realm is available to us through the power of the Holy Spirit in us. The power of the Holy Spirit is experienced as the overflowing of the river of Living Water in our hearts. Divine peace -- God's peace -- comes when we submit our hearts to Him and allow Him to fill us with Himself. Instead of looking for outward manifestations of peace, I will now look inward -- because I know that the peace of God, which surpasses all [human] understanding, will guard my heart and my mind because His realm lives inside me. Hallelujah! Romans 14:17 Because the Kingdom of God is not about eating and drinking [as a human does]. When God reigns, the order of the day is redeeming justice, true peace, and joy made possible by the Holy Spirit.